Please see the "revisited" version of this post, published in July of 2016, by clicking here. Students must watch the video for the assigned lesson and take notes in their SSS packets (this stands for "Student Success Sheets" and I have them for each unit/chapter) I have created for them. 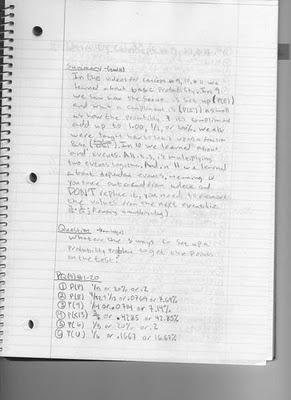 I check to see that these notes are complete and thorough and that everything I wrote down the students have. Because they can pause and rewind, there is no exception for these notes not being well done and complete. Some of my very high achieving students have asked "Do I have to watch the video" and under certain circumstances, I say "no", but you still have to complete the notes on the SSS packet. 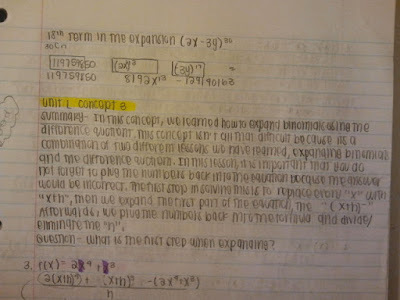 A lot of times these students know how to figure out the problems without my explanation and I have no problem with them completing the notes that way. They have to check their SSS page versus the finished SSS page on Edmodo to make sure their notation and answers are correct. A few issues I am already noticing with this is that there are still important things that I say about the concepts that students miss if they don't watch the video. This includes details about how/why we do something, details about notation, etc. Some thoughts that have come to my mind to alleviate this is to divide the videos into sections (whether this becomes separate videos or just a heading on the video). The first portion of the video must be watched by all students of all levels and will cover the basics, vocabulary, notation, purpose, etc. Then, the second half will cover the few examples I go over for the students before their first class day. I'll still have to think about this. Thoughts? For my Algebra 1 students, I already have been making an additional "part 2" of most videos that has even more extra examples than in the main video for students to watch or go back to later. I like that setup because the main video covers 2-3 examples, depending on the length of the problem. However, in my SSS packet I have at least twice as many examples for students to work through. I still want those to be explained to the students; I figure the more the better! Then they have no excuses! Students have to write a summary of what they watched in the video. This is supposed to be completed immediately after watching to pretty much judge "Did you understand what you just watched?" I tell the students that their summary tells me if they understood the video or not. If I can't make sense of their summary, then they probably didn't understand it well enough because they couldn't verbalize it. I tell them that if they can't summarize it, they need to re-watch it because they didn't get it. In class, we talk about the summaries. Since I just started this, we are doing this mostly as a whole-class activity to train the students on what I expect to see. We put a "WSQ" on the screen and read through it. Then, I have all the students vote if they think it was a "Great" "Good" or "Bad" summary of what we watched. Yes, I have had all three levels of summaries and students have realized that if their summary is bad we will say so and talk about it. I ask the student whose notebook is on the screen what they would vote for themselves and then we talk as a class or in their small groups about what is missing, or what pieces that are in there are the REALLY IMPORTANT pieces that should definitely be included. 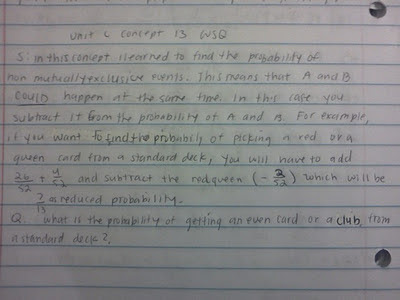 I have students look at their individual WSQ's, give themselves a grade, and add anything they were missing. My ultimate goal is that we only have to do the whole-class "norming" process once a week or even once a unit. The rest of the time, the students will be sharing and discussing their summaries in their small "WSQ groups" of four students. That way every student has a chance to talk every day and they are all held more accountable. I want students to be okay talking about what is both good and bad about their summary and realizing what important pieces need to be added. 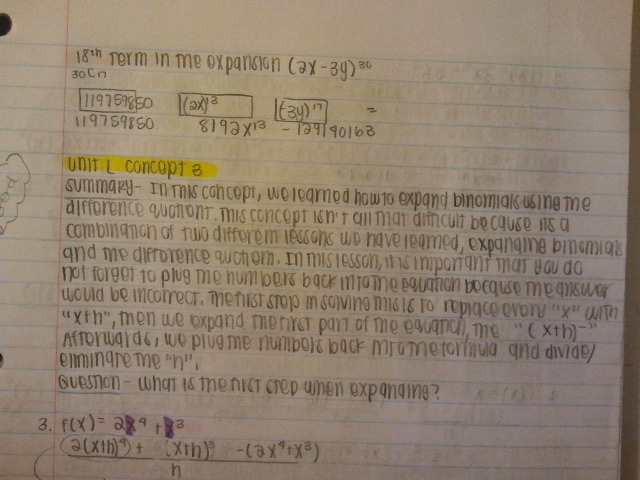 In my Algebra 1 class, I actually wrote an entire summary with the class all the way through one day. It was a pretty complex lesson on Graphing Systems of Linear Inequalities and I wasn't really happy with the WSQ that was put on the screen. I realized that my students might need a better model of what I am truly looking for, rather than always calling their summaries "bad" or "good minus" (I let them grade themselves as Great +, Great, Great -, Good +, Good, Good -, Bad +, Bad, or Bad -). I think it was one of the most beneficial times for my students to realize what a good and complete and DETAILED summary should look like. That also may be something I need to model once a unit or so to get my students back on track. Most of all, the purpose of the summary is to get my students Thinking & Writing (at home), and Reading, Speaking, and Listening (at school) - it all comes down to TWRLS... we need to support our students' language development at all grade levels and in all subjects. (3) A question that could be asked and expected to be answered after watching the video. This may be a question you think your classmates might have, or just a good question you think I (the teacher) would ask and expect you to know. In class, we look at a few questions as a group, and I always ask the writer "Is this a question you know the answer to or don't know the answer to?". Then, I have the students answer the question in their small groups and then we share out to the class. (1) I want my students comfortable asking and answering questions of each other, especially when they are confused. (2) I just want my students asking questions, period! That is where discussion and deeper thought come from! Every day, students ask their questions in their groups of four before getting to work on the problem set. That way, students who have a question they DON'T know the answer to can get it answered, and students who asked a question they already know can see if their group members also know it. I am there to help if the group gets stuck on answering a question. With my Math Analysis Honors students, we go a step further... I challenge them to make their questions "HOT" and move up Bloom's Taxonomy past the basic Knowledge and Comprehension level. I have them tell me what level they think their question is at. I have given them the question starters for each level of questioning (see link on top right) and I think that helps them. The better their questions, the deeper we can probe, and the better discussions we can have. When I came up with this WSQ idea at the start of the new year, I really didn't have a clear vision of what it would look like. What I described above came out of random thought, to be honest. Every day though, I was able to think about what I liked and didn't like about the process, and the students got used to what I expect. I am already SOOOOOOOOOOOO HAPPY with what I have been seeing and we have only done this for 9 or 10 class days! I really hope my students continue to develop their TWRLS, which ultimately I hope leads to them not only understanding the math BETTER but DEEPER!!! I asked my students to submit a picture of what they thought their "best" WSQ was from the last two weeks. Here are some samples for today's post. I am an English teacher, and I really like that you have incorporated a writing component. These ideas sound good. I hope they play out well. I hope they do as well... Our school's motto is "read! Write! Learn!" and I have always struggled to find ways that meaningfully incorporate that in my classroom. I really hope this continues to grow and work. This is awesome. Thanks for sharing your method in such detail. I had tried having kids summarize in the past with mixed results and I couldn't really come up with a way to get them more involved in the summarizing process (especially with Common Core coming up next year). I will probably steal components of this for my next unit. Crystal, I am a first year teacher and observed in a classroom last year that was flipped. I have been wanting to try it but am a little reluctant after what I observed. 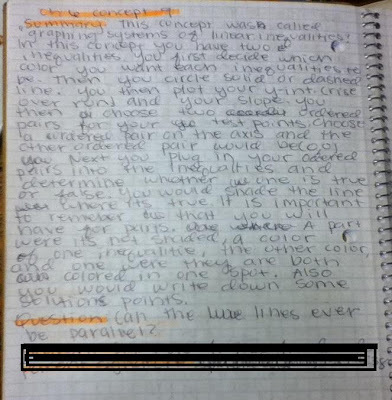 The students hated it and I didn’t see how they were kept accountable for watching the videos. I see that you are doing the WSQ, how and how often do you check these? I am also new to using Edmodo. Do you have your students post assignments there? The WSQ's are checked on a daily basis, since right now in my class they do watch a video every night for homework. Students have them out and open before the tardy bell rings and I give them a minute or two to skim back through their summary before we begin our "WSQ" time. Most students are going to "hate" any sort of change or anything that makes them work harder than they already are. At first, some of my students complained about the videos for a variety of reasons...some of my students complain about having to write the summaries, calling them "tedious", and several of my students "hate" having to come up with a question because "it's just too hard". I don't think we are ever going to get teenagers to stop complaining. So, we have to just think about what our ultimate goals are and what the purpose is for what we are doing. Once students get used to the change, they really start to succeed. I had to have a few individual meetings with students about their negative attitudes towards the flipped classroom and adjusting to change. Since those conversations, those three students in particular have really started to succeed because they are approaching the change with a more positive attitude. I use Edmodo as my class website. I post all of my resources as well as links to my videos (even though they can be searched for on YouTube and SchoolTube) in the library. Students can ask questions and then if I do have an assignment I want them to submit electronically, I use Edmodo's assignment feature. 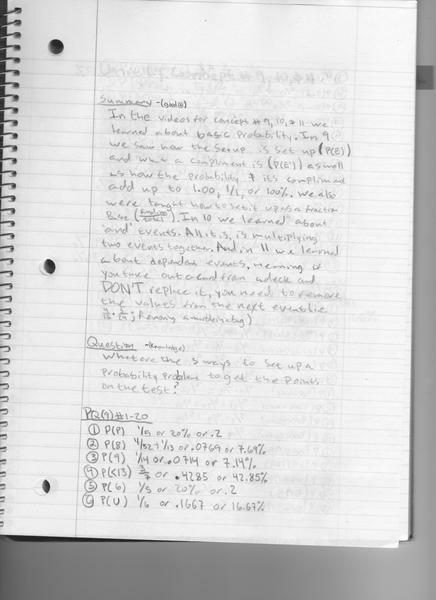 I have considered having the students submit their WSQ's online through edmodo so I can get the feedback even before we arrive in class, but I feel like having them handwrite it and then having it in their notebook always to reference is more important at this point. I hope that I answered your questions - feel free to ask follow-ups if I didn't :) Good luck! Can you please give some examples on what is on your SSS? thanks for your comment. If you take a look at my FAQ page, it talks about my SSS and gives some links to a few examples. This is awesome! Thank you for sharing. I had heard WSQ over and over and really appreciated seeing your work.